This week’s home video releases range from an intimate foreign film about love and romance to a big-budget, science-fiction spectacle. In 2009, director J.J. Abrams gave the “Star Trek” franchise a boost by presenting the earliest exploits of Starfleet officers James Kirk, Mr. Spock and others from the original television series. His approach was so creative that he rebooted the series without discarding any of the mythology long-time fans hold dear. Using the old science-fiction trick of time travel, Abrams built a world where two Spocks (one young and one old) coexist. By so doing, he made it clear that his “Trek” is meant to deepen – not destroy – one’s appreciation of the original series. Abrams maintains the same reverent tone with “Star Trek Into Darkness,” but the movie is not a simple homage. Despite countless references to the original show and the movies that followed, “Into Darkness” works as a standalone product. It has the spectacle one expects from a modern blockbuster, but it also has depth, both in plotting and characterization. 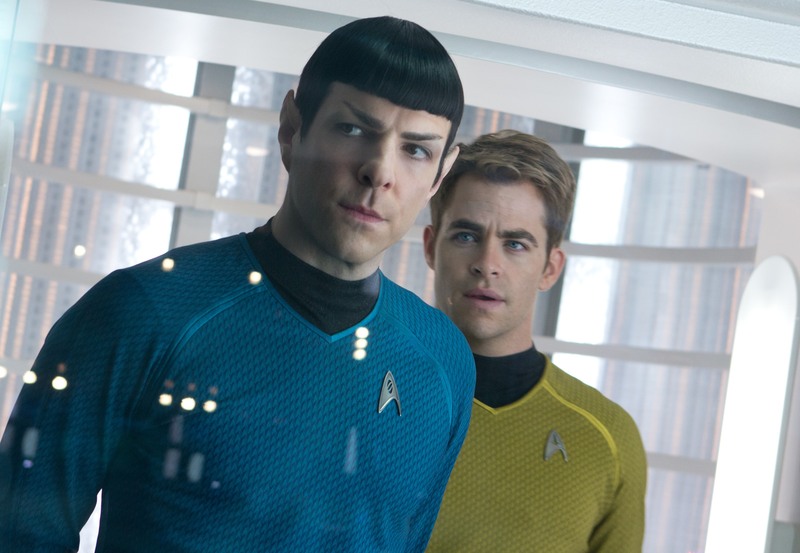 As in the original series, Kirk (Chris Pine) and Spock (Zachary Quinto) are opposites, yet they are so well rendered that their bond is easily comprehended. Other key characters, including Uhura (Zoe Saldana), McCoy (Karl Urban) and Scotty (Simon Pegg), are equally well built. This puts “Into Darkness” among a rare breed of blockbusters: the sort that value emotion and character drama as highly as action. The story takes place shortly after the events depicted in Abrams’ 2009 film, and it sends Kirk, Spock and the rest of the Enterprise crew on a deadly journey. When a former Starfleet agent named John Harrison (Benedict Cumberbatch) turns traitor and launches two attacks on Earth, Kirk is given the OK to hunt and kill him. The mission is troubling, particularly since Starfleet officers are trained to use force as a last resort. Also, as Kirk draws closer to his prey, he and the rest of his crew realize they’re pawns in a game they don’t understand. Pine, Quinto, Saldana, Urban and Pegg deliver terrific readings of their characters. Out of necessity, they mimic traits of the actors who originated their roles, including William Shatner (Kirk) and Leonard Nimoy (Spock), but they avoid simple replication. Because their versions of the characters are younger and less refined, the actors give them edge. For long-time fans, the result is a new look at old friends, and it’s refreshing. Abrams presents his material with a compelling visual style that – apart from a strange and annoying penchant for lens flares – is sleek and beautiful. He also paces the story perfectly, giving viewers all the information needed to invest in the plot without letting things bog down in details. If “Star Trek” creator Gene Roddenberry were still alive, one imagines he’d be proud. The DVD of “Star Trek Into Darkness” has no extra features, but the Blu-ray releases come with seven making-of featurettes. In theaters, “Peeples” ranked among the poorest-performing movies ever produced by Tyler Perry, a fact that’s unfortunate because it has more charm than most of the films in his catalogue. Realistically, it’s difficult to hold Perry accountable for the movie’s successes or failures. Although his name is attached to the title, “Peeples” is the brainchild of Tina Gordon Chism, the project’s writer and director. The story centers on Wade Walker (Craig Robinson) and Grace Peeples (Kerry Washington), a young couple who have one big issue: Grace is afraid to introduce Wade to her ultra-stern father (David Alan Grier). When Grace takes off for a family retreat in the Hamptons, Wade pushes the issue by showing up unannounced. Although he is welcomed into the Peeples home, he quickly discovers that Grace’s dad is indeed difficult. Nevertheless, he spends several days attempting to insinuate himself into the family. Obviously, “Peeples” isn’t novel or inspiring. In fact, it’s little more than an urban version of “Meet the Parents.” Nevertheless, Chism draws fine performances from her cast, and they make the most of the tired material. Robinson and Grier are particularly strong, and it’s fun to watch them spar with one another. Although best described as a romantic comedy, “Peeples” isn’t laugh-out-loud funny. Cute is a better adjective, and the film has warmth that’s missing from many of today’s dramedies. Chism also does a decent job with pacing. She seems to realize her script is insubstantial, so she brings the project home in a breezy 95 minutes. Because “Peeples” is over so quickly, viewers don’t have much time to think about how often they’ve seen this story before. They can, however, smile at the antics of Robinson and Grier. Whether that’s enough, depends on who’s watching. DVD and Blu-ray extras include a making-of featurette, a gag reel and an audio commentary with contributions from many of the cast and crew. Danish writer-director Susanne Bier (“Things We Lost in the Fire,” “In a Better World”) delivers one of the best romances of 2013 with “Love is All You Need,” an off-kilter international film about wounded souls who bond in unlikely fashion. In one of the great breakup scenes in film history, a cancer-stricken hairdresser named Ida (Trine Dyrholm) finds her husband, Leif (Kim Bodnia), making love to another woman. Rather than beg for forgiveness or plead false innocence – the typical reaction in screen portrayals of infidelity – Leif turns the situation around, off-handedly admitting guilt but arguing that Ida’s illness is a burden for him. He then leaves, saying he’ll see Ida in Italy where their daughter is planning her wedding. Bier also uses early scenes to introduce Philip (Pierce Brosnan), a serious-minded Englishman who, having failed to recover from his wife’s untimely death, has immersed himself in work. Because he is handsome and wealthy, women approach Philip constantly, but his anger prevents him from acting on their advances. Ida and Philip are from different worlds, but they literally collide in a minor, parking-garage auto accident. As they trade information, they learn that it’s Philip’s son who will marry Ida’s daughter, and the stage is set for an unusual-but-fulfilling romance. Bier does a lot of things right with “Love is all You Need.” Most importantly, she draws fantastic performances from her actors. Every character in the film is well drawn even though there’s a lot going on. This is particularly true when the action moves to Italy for the wedding of Ida’s daughter, Astrid (Molly Blixt Egelind), and Philip’s son, Patrick (Sebastian Jessen). Many movies are set during wedding preparations, and most aren’t as dramatic or funny as their creators intended. Bier finds the perfect tone, however, by giving her characters darkly comic material and treating it with extreme realism. For instance, it’s farcical when Ida’s husband brings his mistress to the wedding, but Bier establishes the man as such a cad that the moment is as honest as it is comical. The most noteworthy flaw in “Love is All You Need” is that too little screen time goes to the developing relationship between Ida and Philip. Bier, Brosnan and Dyrholm do such a fine job fleshing the characters out individually that it’s natural to want more interaction between them, especially since they are the engine that drives the project. This is, however, a minor complaint in a drama that is otherwise sincere, emotional and executed with finesse. “Love is All You Need” is presented in a broad mix of English, Danish and Italian with subtitles, so anyone lacking fluency in all three tongues will be reading constantly. This actually adds to the picture’s realism, making it an immersive cultural and emotional experience. DVD and Blu-ray extras include cast interviews from the 2012 Venice Film Festival, an audio commentary with Brosnan and Bier, and a Q&A session with Brosnan, Dyrholm, Bier and screenwriter Anders Thomas Jensen. “We Steal Secrets – The Story of WikiLeaks”: Oscar-winning documentary filmmaker Alex Gibney looks at Julian Assange and his controversial WikiLeaks website. The movie also spends considerable time on Pfc. Bradley Manning, the U.S. Army soldier who was convicted of espionage for passing government secrets to WikiLeaks. “Parade’s End”: Five-part HBO miniseries based on the novels of Ford Madox Ford. The story is set during the World War I era, and it centers on a love triangle between an honorable Englishman (Benedict Cumberbatch), his manipulative wife (Rebecca Hall) and a young suffragette (Adelaide Clemens). “Chicago Fire” – Season One: The second season of this drama – about paramedics and firefighters working in the Windy City – will debut toward the end of the month on NBC. That gives newcomers a couple weeks to watch the 22 episodes on this boxed set. “La Cage Aux Folles”: Criterion Collection restoration of the much-loved, 1978 French film about a gay couple who pretend to be straight when their son brings his fiancée and her conservative parents for a visit. Directed by Edouard Molinaro. Presented in French with English subtitles. “The Smurfs” – The Legend of Smurfy Hollow”: Twenty-two minute animated film where the Smurfs explore a supposedly haunted hollow. Because the movie is so short, the suggested retail price is just $6.99, and some retailers are selling the title for less. “Supernatural” – The Complete Eighth Season: This long-running CW series returns for a ninth season in October, and fans can get back in the mood with the 23 episodes included in this set. Jensen Ackles and Jared Padalecki star as brothers who battle demons, ghosts and other forms of supernatural evil. “Blue Bloods” – The Third Season: Twenty-three recent episodes of the CBS drama about a family with a long history of service to the New York City Police Department. Donnie Wahlberg, Will Estes, Tom Selleck and Len Cariou star. “Star Trek” – The Original Series – Origins: Folks enamored by “Star Trek Into Darkness” may want a deeper look at some of the characters and issues presented in the film. This release contains five key episodes of the original series, each one dedicated to the first screen appearance of a major “Star Trek” character or species.